The recent Virus Identification and Management for Production Nurseries webinar is now available online, to give growers greater assurance about identifying and managing viruses. Hosted by Dr Andrew Manners and John Duff from the Queensland Department of Agriculture and Fisheries, the content covers how viruses spread in production nurseries, common virus and virus-like symptoms, vectors, identification methodologies and management options available to growers. Dr Manners believes the key is to keep an open mind and check factors that cause virus-like symptoms; don’t assume a virus is present. Virus-like symptoms can be caused by many factors including mites (that may only be visible with a microscope), inappropriate growing media and water conditions, environmental conditions, nutritional regime and phytotoxicity (particularly herbicides that reside in the growing area for long periods). All viruses are spread by propagation and grafting. Some are spread by touch, secateurs and or a vector organism. However, some species asymptomatic, that is, they do not show visible symptoms. Using pathogen-tested mother stock plants can be an important strategy, particular when the pathogen reoccurs frequently. Once a plant is infected with a virus it cannot be cured. Therefore, it is critical to remove infected plants hygienically and prevent infestations from reoccurring. Dr Manners encourages growers to take a practical stance and check new growth for insects and mites with a hand lens and 40x microscope in the first instance. In most cases, virus symptoms start to appear in the new growth as leaves are expanding. If symptoms are in the old growth and not the new growth, chances are it is not a virus. 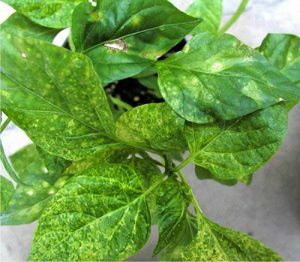 If a virus is still suspected, Dr Manners recommends utilising a diagnostic lab by sending images of new growth and of the whole plant. The images should be in-focus, and of a high quality as this will aid in identifying any issues. The webinar follows on from the Mite identification and management webinar, which is also available online via the NGIA YouTube channel.